If you like to eat healthy, this carbohydrate calculator (or carb calculator for short) is an excellent tool for you. It can assess how many carbs per day you should eat in order to maintain a healthy, balanced diet. Naturally, no diet is complete without other macronutrients, such as proteins or fats; head to our macro calculator for a more comprehensive analysis of your eating habits. Carbohydrates, just like proteins or fats, are macronutrients. They come in many different forms, such as sugars, starches, or fibers, and are present in most of our foods. You can come across them in bread, potatoes, and pasta, but also in fruits, milk, or cookies. One of the possibilities to group carbohydrates is to split them into simple and complex carbohydrates. Simple carbohydrates are monosaccharides and disaccharides. As their chemical structure is fairly uncomplicated, they are easy to digest. They provide a lot of energy, but you will soon feel hungry again. Some sources of simple carbohydrates include white bread, cookies, and white sugar. Complex carbohydrates are polysaccharides - more complicated chains of sugar molecules. They are considered healthier and tend to fill you up for longer. Fruits, vegetables, and whole grains contain a lot of complex carbohydrates. No golden rule dictates how many carbs per day you should eat. 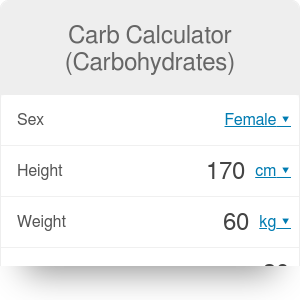 However, our carb calculator can provide you with some general guidelines that you can use. The minimum recommended percentage of carbohydrates in your diet is 50%. It means that at least half of your energy should come from carbohydrates. The maximum recommended percentage is 70%. If you eat more carbs, you probably lack other macronutrients, such as proteins. Our carb calculator uses this exact formula to give you the optimum range for carbohydrate consumption. You should remember, though, that consulting this calculator is not equivalent to a visit at a dietitian; consult a professional for a personalized diet plan. Even though it is quite important to keep your carbs intake between 50% and 70%, it is essential to limit the simple sugars (or simple carbs). We recommend to never exceed 10% of your total calorie intake. Why are these carbs bad for you? Most of them have a high glycemic index (GI). It means that they break up faster and rapidly enter your blood system, increasing blood sugar levels. If you don't limit the intake of such carbs for a long time, it may even lead to diabetes! Carb Calculator (Carbohydrates) can be embedded on your website to enrich the content you wrote and make it easier for your visitors to understand your message.